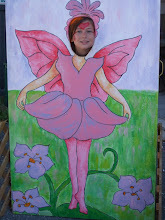 The 25th Annual Fairy Festival is scheduled for Saturday, September 8th and Sunday, September 9th. Held in the herb gardens behind the shop, and sprawling into the little alleyway behind the business, this event is perfect for ages 3 - 11, and all who believe! One of the activities at the Fairy Festival is a fairy door hunt. These colorful and creative fairy doors appear throughout the garden, tucked in little nooks and crannies, just waiting to be discovered! Some folks try to find every door and others just enjoy the surprise of finding one or two. I am sure someone special lives here. We've been told this is the hardest one to find! Would you hunt for fairy doors? What fun! I'd love to be there to hunt for the fairy doors. Yes, I would be searching out the fairy doors. I love each and every one of them. If I lived closer, I would LOVE to come and play! A friend of mine has fairy doors at the base of trees throughout her (extensive) gardens, and while she created them for her grandchildren, I adore them too! I need to start adding these to my garden!! !